1959 Top 20 Hits. 1959 Top Music Hits. 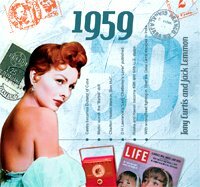 If you're lookin' to be the hit of your 1959 birthday or 1959 anniversary party, then you'll want to buy this music of 1959 found on our CD! This list of 1959 top hits will have people smiling as the song do their magic! Our 1959 song list includes: Cotton Fields (Harry Belafonte), Goodbye Pork Pie Hat (Charles Mingus), Heartaches By The Number (Guy Mitchell), I Know (Perry Como), I'll Never Fall In Love Again (Johnnie Ray), Jump For Joy (Dave Brubeck), Mack The Knife (Louis Armstrong), Mambo No.5 (Perez Prado), My Nova Scotia Home (Hank Snow), Oh! Carol (Neil Sedaka), One Night (Elivs Presley), Rawhide (Frankie Laine), Satin Doll (Duke Ellington), September Song (Tony Bennett), Shout! (The Isley Brothers), Sleepwalk (Santo & Johnny), Someone (Johnny Mathis), The Battle Of New Orleans (Johnny Horton), The Three Bells (The Browns), The Wonder Of You (Ray Peterson). Twenty 1959 songs in all. See also our other 1959 gifts.